Cathy’s father has lost his memory. She must help him recover by running the family pizza parlor business. Fortunately, Pac-Man is there to help her out. 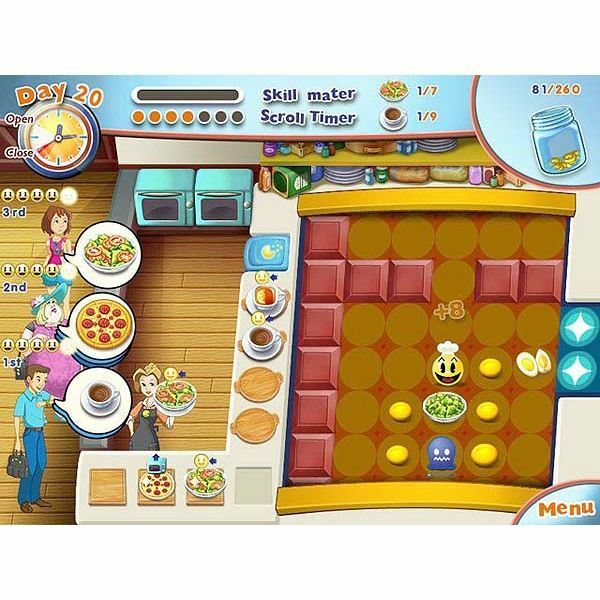 Build the pizza parlor into a profitable success by using fast clicking and strategic time management skills. In Pac-Man Pizza Parlor, you control both Cathy and Pac-Man to make and serve food and drinks to waiting customers. As customers arrive, orders will appear as image icons in a thought bubble. Food items are available through a conveyor belt in the center of the kitchen. Click on needed items to cause Pac-Man to retrieve and transfer them to the food counter areas. To collect food items for delivery, click on them to cause Cathy to pick it up. Then click on the customer to deliver the customer’s order. Other food items require preparation. Pizzas and potatoes will need to be placed into the oven after Pac-Man gathers the appropriate ingredients. Cathy can then place the uncooked food into the oven for baking. Once the food is cooked, click on the item to pick it up and then click again on the customer to deliver it. In between levels you can purchase items to upgrade equipment, improve Pac-Man or Cathy’s performance or decorative items for the pizza parlor. You can also purchase a variety of clothing items for Cathy. As the game progresses, levels become more difficult when the conveyor belt will start moving up on occasion. If Pac-Man gets caught at the top while it is in motion, you lose points and he is placed onto the starting position in the kitchen (right hand side of the screen). Win the game after all 80 levels have been completed. On occasion throughout the game, you will get to play a mini-game. These are short versions of a match three style puzzle. The object is to get rid of tiles on the board by creating like matches of three or more items. Completion of the puzzle unlocks an item that goes towards helping Cathy’s father recover his memory. Cancel Pac-Man’s movements by right clicking with your mouse. Cathy can hold two items at once. Use this to your advantage and try to chain customer deliveries for higher points. Each customer can have a maximum of five orders at a time. Ghosts can turn into fruit items temporarily. Have Pac-Man collect them for bonus points. Decorative items and Cathy’s clothes you can purchase do not add any bonuses or increase customer patience. Instead, save your money and purchase Pac-Man or Cathy’s personal upgrades to increase their travelling speed. As soon as you can, purchase additional plates to increase the amount of food items that can be stored on the counter. Different customers will have varying amounts of patience. Their mood is measured by the number of smiling icons displayed above their heads. Always try to serve the most impatient customers first to avoid losing points. In the later levels in the game, more barrier blocks will be added to the kitchen section to make Pac-Man’s travel path difficult. For higher scoring, try to find the shortest route to pick up the most items as quickly as possible. 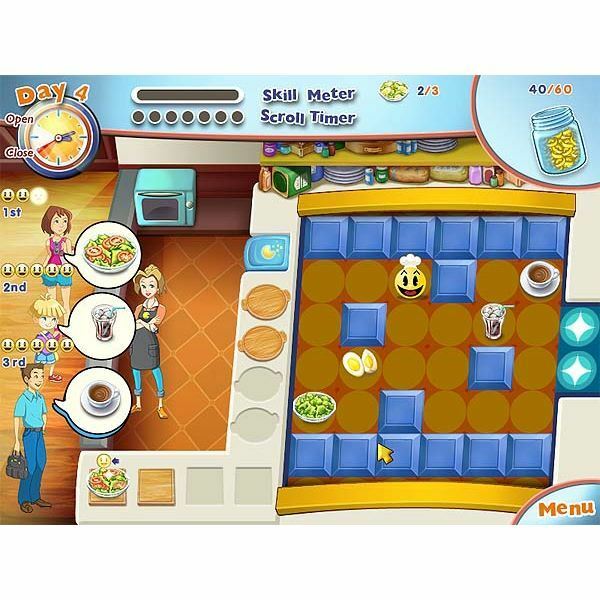 The screenshot images for the Pac-Man Pizza Parlor article were created by Sheila Robinson.